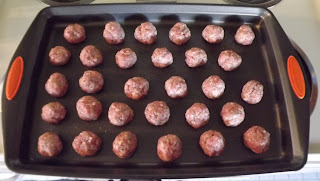 I came across the recipe for Easy Slow Cooker Meatballs on one of my favorite sites, AllRecipes.com. The recipe as published is very easy but I knew I could make it better and in reading the comments from other people about the recipe, it became obvious that there were a few errors in the recipe and that the meatballs and sauce were turning out both a bit bland and too greasy. (Note: you can get fresh ground veal and lamb at any good butcher counter like what is found at Whole Foods, New Seasons, etc. I found it frozen at Haggen's and used that). Take meat out of refrigerator about 30 min prior to starting to let some of the chill out of it. That will make it easier to mix, not as cold on your hands, and the prepared meatballs will be better prepared to go in to a hot oven. 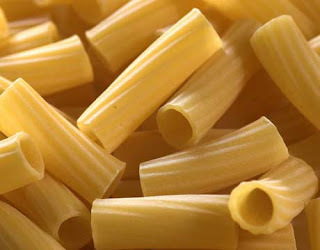 In a large bowl, combine meat, parsley, garlic, Italian seasoning, onion, egg and cheese. The best way I've found to mix up ground meat like this is to just use my hands. Mix up everything very well, being sure to mix the different meats together. Combine the bread crumbs in to the mixture until it is a consistency that will easy form together. Coat baking sheets (you'll need 2) with cooking spray. 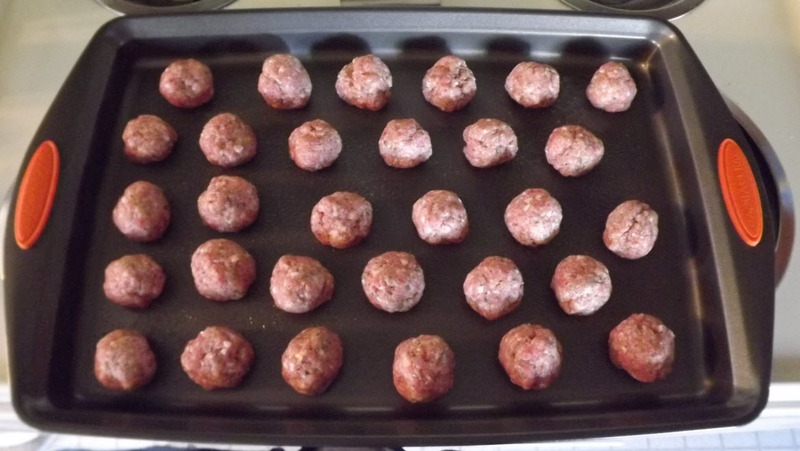 Form meat mixture into meatballs approx 1-1.5" in diameter and place on baking sheets with at least 1/4" spacing between them. 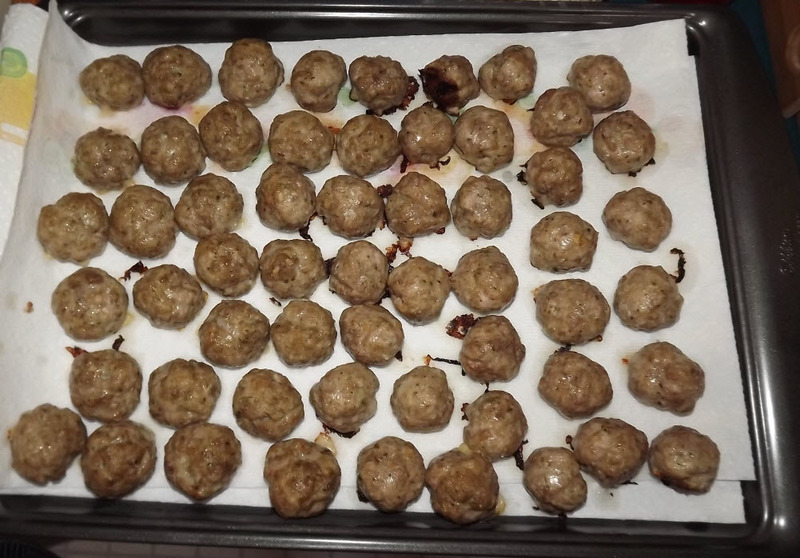 Bake meatballs for 20 minutes. Immediately transfer them to another baking sheet that is lined with a few layers of paper towels to drain them. Pat them firmly on top with another paper towel to soak up additional grease. In slow cooker, combine tomato paste, 2 jars of the spaghetti sauce, sugar, and about 4oz of the wine. Stir it all together well and then stir in the mushrooms and meatballs. As usual, my slow cooker had these completely cooked and ready within 4-5 hours. As they cooked, I stirred them every hour and also tasted the sauce, adding the rest of the wine along the way. I also sprinkled in about a teaspoon of red pepper flake as the sauce was a bit bland for our taste. 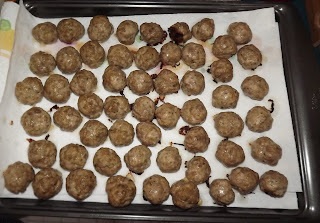 You could also add some red pepper flake to the meatball mixture and I think next time I make these I will be doing that to give the meatballs a little more zing. I served the meatballs over large rigatoni noodles with fresh Italian bread and Caesar salad. So sorry about your bolognese sauce not working out for you...I altered the recipe per your comment. I did use a tablespoon of course kosher salt and it turned out great for me. Sorry yours did not.